Madeline Hatter, daughter of the Mad Hatter, is throwing a Hat-tastic Party with all of her friends to help save the Wonderland Grove from losing its wonder and magic. With this set, girls can recreate the story, displaying all of their dolls at this truly Hat-tastic Party. 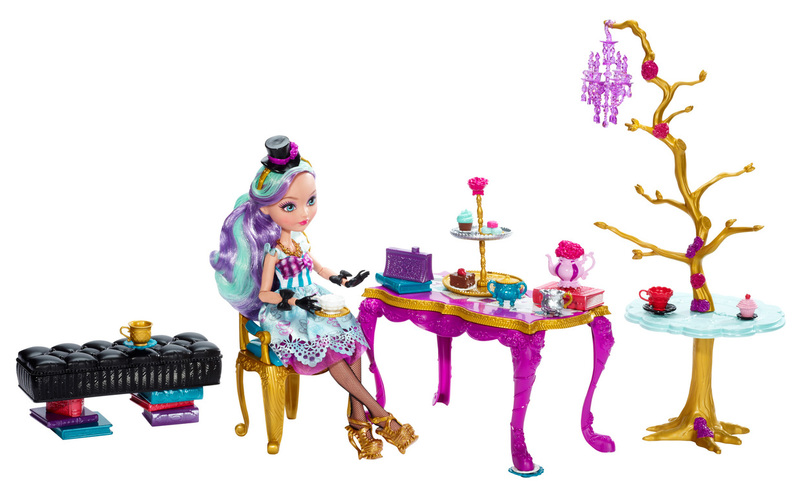 The golden tree doubles as an enchanting tea party setting and as a jewelry tree for the girl! Recognizable from the webisodes, it comes complete with all the items needed for a tea-riffic event, including Madeline Hatter doll. Hang a chandelier from the top of the tree, display teacups and jewelry on the two tabletops and seat three dolls on the chair and bench for an epic party or scenic display. Three teacups and saucers are included for the guests (additional dolls sold separately); plus a child-size ring - with a charming teacup and saucer design - makes a spellbinding gift for the girl and the first addition to her tree! Open the bench to store special items inside. Madeline Hatter doll will captivate in a harajuku-inspired dress with bow-adorned bodice, teacup print skirt and lace-decorated hem. Enchanting shoes have ruffle trim details and teaspoon-shaped heels. A black top hat-shaped headband, matching bow gloves, teabag earrings and a statement teapot necklace finish this fashion story. 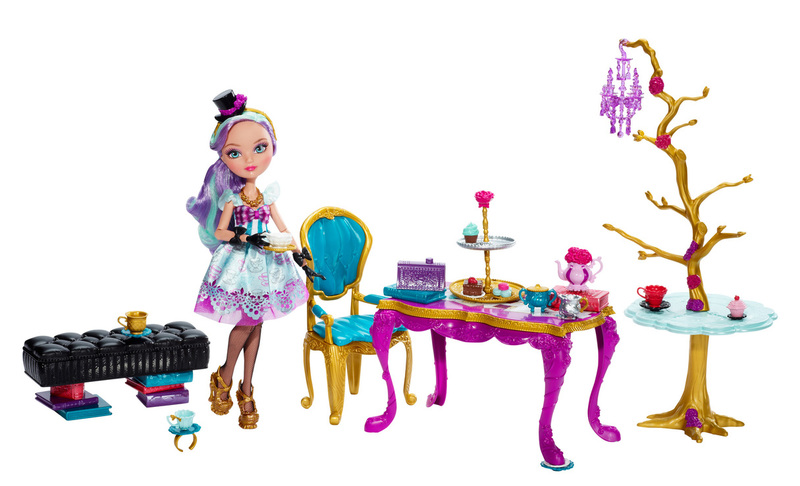 The fableous Hat-Tastic Party set comes with jewelry tree, table, bench, chair, Madeline Hatter doll, three tea sets, themed treats and ring for the girl. Collect her friends forever after (each sold separately) to expand the guest list. Doll cannot stand alone. Ages 6 and older. 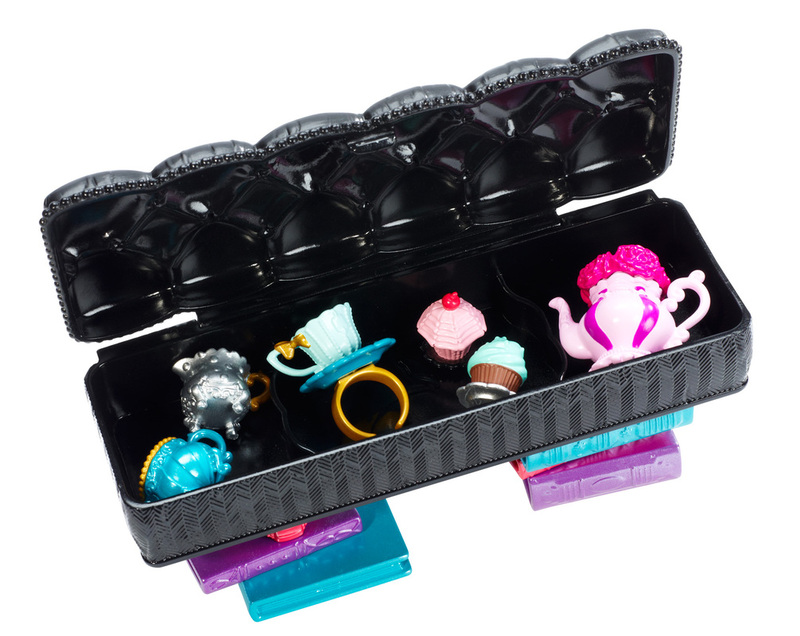 Recreate Madeline Hatter doll’s Hat-tastic Party with this tea-riffic set! Comes with Madeline Hatter doll in a harajuku-inspired dress. A golden tree doubles as an enchanting tea party setting and as a jewelry tree for the girl! A chair and bench make room for three dolls at the full table. 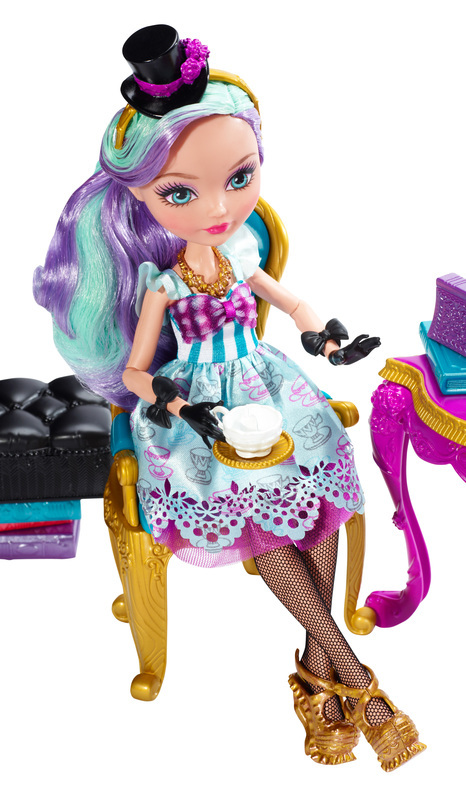 Three teacup and saucer sets are included for the guests (additional dolls sold separately). 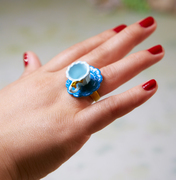 A ring - with a charming teacup and saucer design - makes a spellbinding gift for the girl and the first addition to her tree!